Love to ramp up the volume in your car? Enjoy playing the hottest tunes, with the windows down, elbow on the side? With stock speakers, you won’t be able to do this and not feel ashamed. Let’s find the best car speakers that will spin heads on the street when you turn it up! How To Choose The Best Car Speakers? Getting a new set of speakers to upgrade your ride with fine, strong audio setup is not as simple as getting into the store and buying the first speakers you set your eyes on. The list of potentially unwanted scenarios is quite large, wouldn’t you agree? 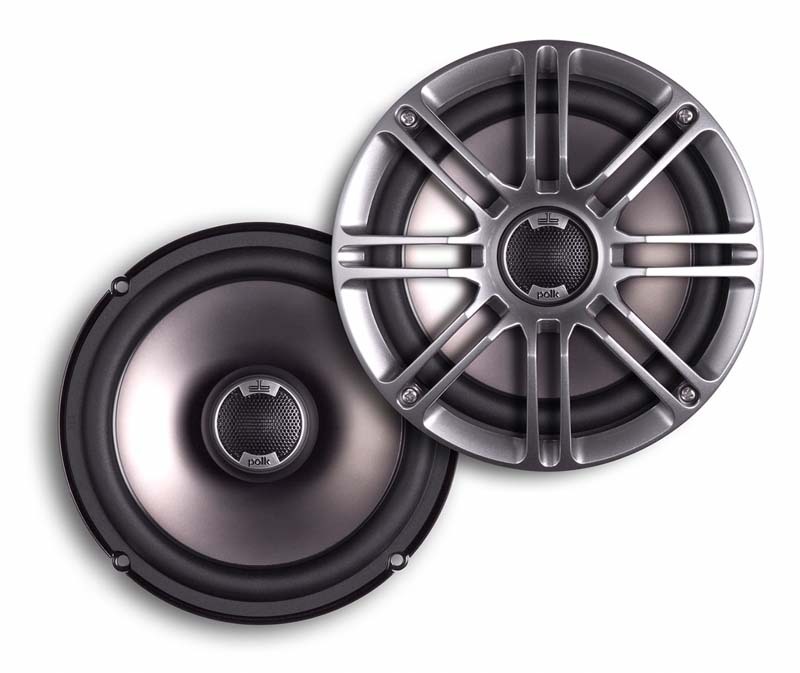 To get the best speakers for your car, first you need to know how your audio system works. The main unit consists of the receiver, which transfers the power output received from the source (player or radio). Before the transfer, the power is either amplified or transferred to the outer amplifier. From this point, the power output goes through channels, and travels to your speakers which vibrate and create a sound. From this definition, we can come to a simple conclusion: the first thing to look for when buying speakers is to know the amount of channels and the rated power output. This way you’ll ensure the proper setup and your speakers will fit this basic requirement. The audio systems installed in the vehicles today usually have two, four, or six channels. Simply said, if you have a two-channel audio system, the two-channel speaker system (subwoofer + tweeter) will be the best for your setup. Furthermore, this doesn’t mean that you can have just one subwoofer and one tweeter. You just have two channels, which means you can have two types of speakers, and the amount of individual speakers you can connect depends on the wiring and the power output. Logically, you won’t need more than three to four tweeters spread around you in the vehicle cabin, and the subwoofer somewhere in the bottom of the car, or in the trunk. With more channels, the more sophisticated sound systems can be built in the car. We’re talking four and six-channel systems here, used to reach much deeper, sophisticated sound, like in the home cinema systems and the like. Depending on the style of music and volume levels you prefer, you need to watch for power and sensitivity of the speakers. The sensitivity is measured in decibels, and it represents the overall loudness of the speaker. The decibel rating of car speakers usually goes around 88db. The power consumption of a speaker is directly correlated with the sensitivity. You need to power up the speaker to produce the desired volume, and with higher sensitivity comes a higher power consumption. 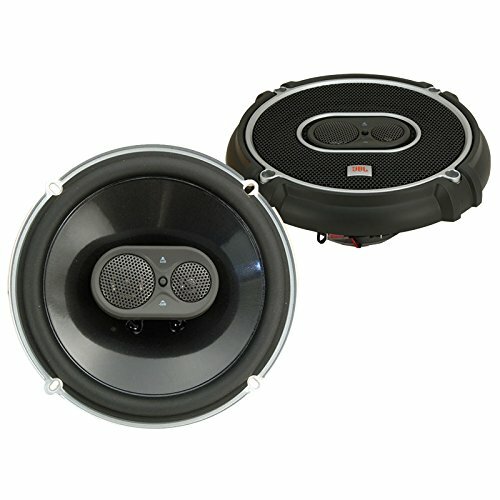 When looking for car speakers, you have to know how high volume you prefer and how much power your player can deliver. If you purchase speakers which require high power output which your player can’t deliver, you’ll have to use an amplifier. Coaxial speakers are much more spread on the market, since they are affordable. They are easy to install, and provide a quality sound for the money. On the other hand, component speakers bring the audio experience to another level with separate woofer and tweeters which can be moved around to suit your preferences. But that improvement comes with the cost, both financially and physically. They require more hustle to get installed in your car, require a high-quality amplifier, and they are pricey. Choose the type of the speaker depending on your requirements and affinities, and of course, the depth of your pocket. Don’t get surprised that you can buy several coaxial speaker systems for a price of a single component system. And I do repeat, the quality of coaxial speakers audio isn’t that bad. There is a difference between the two, but the question is are you willing to go those extra miles to get it. The size of the speakers you’re about to get is also a very important aspect to consider, simply because you can choose the great system, but if you’re not careful, it won’t fit your car. Measure the space defined for speakers and have these measures with you when you pick the speakers. The size is the biggest factor in the installment process; with an improper size, you’ll have much problems installing the speakers. Consider the size one of the important features while choosing. Here’s one very important thing to consider while in search for the best speakers for car. Not everybody has the budget for the desired speakers, and not everybody is willing to pay for a pricy component system. The JBL GTO638 6.5-Inch 3 Way Speakers (Pair) arrives with the provision of three-way design which is intended to offer premium sound quality. Also, there is the availability of plus woofer cones which are inclined to offer deep bass to enhance the auditory experience. If you want to create the efficient transition between tweeters and woofers, then the GTO638 will come handy with its inbuilt crossover network. These three-way speakers are very lightweight yet offer a massive sound which makes them the leading bestseller on the market. The given JBL speakers also deliver the high-quality sound with great performance and high output. However, they will require an amp to enhance its performance and even with it, they do not have an adequate bass level, unfortunately. Besides that, they come equipped with Intermount III Mounting System which makes them very efficient ton install in any type of car. Coming from the renowned brand that is JBL, the GTO638 certainly belongs to the category of the premium sound quality. Even with some drawbacks regarding the bass and peak power, these speakers are very easy to install, lightweight and extremely durable with a massive sound and they come with a huge JBL warranty. 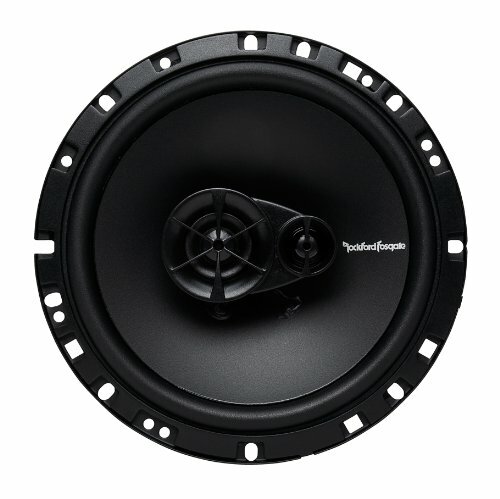 The Rockford Fosgate R165X3 Prime 6.5-Inch Full-Range 3-Way Coaxial Speakers comes in multiple sizes which should make them a suitable replacement for the factory door speakers, especially when you do not want to spend a lot of money. 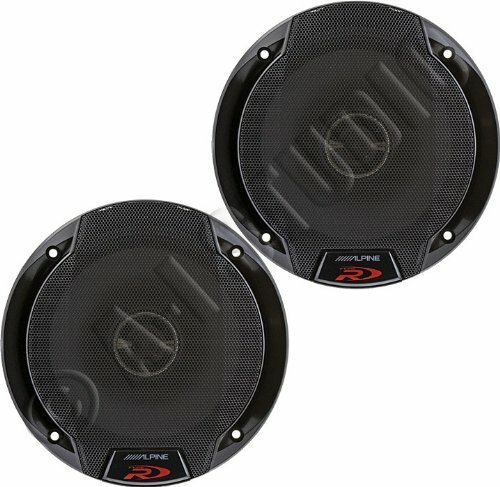 These entry level PRIME series speakers have shallow mounting depth with a wide frequency response for an easy fit and top performance for almost any car on the market. The good thing is that these speakers come with all the hardware you will need including grilles, wires and mounting hardware. However, even with the multiple sizes option, these speakers were not so easy to install, and it took some time with some modifications that I had to do in order to fit them in. Overall they are made of quality materials and do not look cheap, yet they provide some decent sound with very clear highs and mids but with a disappointing bass production, unfortunately. They do have some design issues since their strange shape made them difficult to mount on the car. Also, there is not enough bass, and that may be a good thing since it sounded distorted. Bottom line, if you do not want to spend a lot of money, yet want to get a notable upgrade, the Rockford Fosgate R165X3 is good for you. The JBL GTO939 are the 6 x 9 Inches premium speakers from the GTO series. Each speaker has a carbon-injected cone woofer on a poly frame which is fiberglass-reinforced. Having very accurate frequency responses and being very durable and loud, they are one of the most efficient speakers in the GTO family. They have proven to have an exceptional continuous power-handling abilities, much better compared to the other speakers in its class, especially when it comes to bass quality. Also, they require less power than some other speakers with the same loudness and probably with better sound quality since they were very crisp. However, the only minor downside was the below-average peak power of 300 watts since I wanted the peak power handling to be twice as high. The mounting was also somewhat uneasy, which is a general problem, and you should even be aware that these speakers cannot be installed in some vehicles. These speakers combine high-quality audio with an efficient, loud output and an A-grade for high, mid and low frequencies. However, while the continuous power handling was higher than most of the speakers I’ve tested, the peak power handling was pretty much below average, unfortunately. Regardless, these speakers could easily be a fine upgrade of your car audio system. The Alpine SPR-60 is a two-way coaxial set which is well engineered with a well-balanced sound. It is a less sophisticated version of the SPR-60C version. They are very popular on the market today slightly less expensive compared to the competition yet very similar in performance and quality. However, the design leaves something to be improved in the future. When it comes to sound quality, while the bass sounds great, the highs and mids can be slightly harsh. Don’t get me wrong though, the clarity is there, but it will take some good amps to get the most of these speakers’ potential. Another downside that I noticed is that it takes some time to break-in these speakers. So, do not let the sound quality of these speakers disappoint you at first glance, since the quality will get significantly better over time. Even though the Alpine SPR-60 does not bring an audiophile quality sound which I would desire being an audiophile myself, they have some good sides to consider. If you manage to pair them with a strong amp, you will be surprised how high-clarity bass they can produce. And most of all, they are very reasonably priced. So, if you are on a tight budget – The Alpine SPR-60 will not disappoint you. The Pol Audio DB651 is a versatile component speaker system made from a polymer/mica composite providing big sound with little distortion. If you do not want to throw some serious cash on some component speakers, but you want a decent quality product from a brand name – this set should suffice. Like all Polk DB Series, these speakers are built with high-quality (also very lightweight) materials. However, the only problem I had was the rear OEM sound bar which had a poor enclosure. Thus I needed to modify it to improve the overall sound. Also, even though the low end was very surprising for a 6.5-Inch speaker, I was expecting more bass out of them, but I managed to solve that problem by adding a subwoofer. This set can be ordered in various configurations, shapes sizes giving them various performance and that is what I love the most about it. 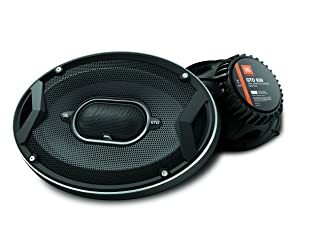 Polk Audio DB651 is a 2-way marine-certified car speaker with liquid-cooled silk tweeters for an easy fit behind any ABS grilles, fairly easy to install. Even though they have occasional tendency to distort sound at high volume, they produce an excellent sound giving the fact that they are set of coaxial speakers, but from a good brand such as Polk Audio. What is The Best Car Speakers? At the end, there can be one winner. And in this case, JBL GTO939 Premium can’t be matched. The customization, the power/sensitivity efficiency, the great sound they provide simply can’t be matched with others I’ve reviewed today. 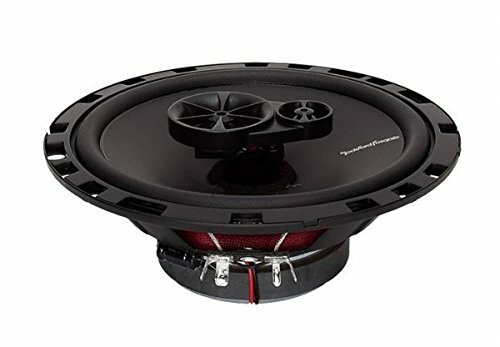 If you don’t have the budget, the Rockford Fosgate R165X3 Prime can be your perfect audio upgrade, which will skyrocket the experience in your car without breaking the bank. At the end, it all comes down to your preferences, affinities and the depth of your pocket.